Specifications: blades 24" or 26" notched or smooth, on 9" steel fabricated spools, triple sealed gang bearings in cast iron trunion housings, 5000 pound rated wheel hubs with dual seals and replaceable wear sleeves, 1 1/2" square hi-carbon steel gang rods, 7.60 x 15 6-ply tires, 3" x 12" hyd. lift cylinder. Eleven widths from 5'8" to 14'4". Weights: 3400 to 6294 pounds. Options: blade cleaners, feathering blade, add-a-blade extensions, rear gang tapered blade group, 9.5L x 15 flotation tires, clevis tongue, hitch jack, rear utility hitch and dura-faced blades. 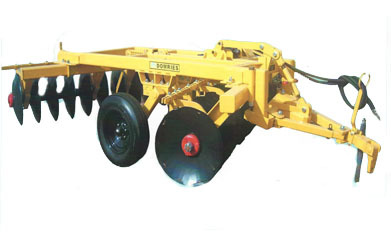 Features: a heavy built wheel-controlled offset disk with tubular steel main frame and gang frames, crank for side leveling, turnbuckle for leveling the disk to the tractor hitch, hitch offset through simple relocation of one pin, dual compression springs for cushioning shock loads.